J'ai/Qui a is a great engaging activity that gets students listening to and saying French vocabulary. It's the French version of the activity "I have... Who has...". Use this School J'ai/Qui a to reinforce school objects in French. I like to time students each time we do this activity to see if we can beat our previous time! They get so excited and competitive! 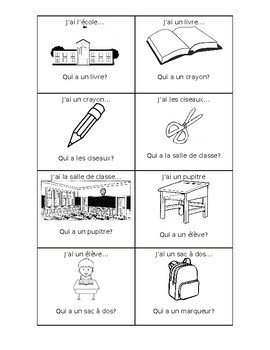 A simple activity that gets students speaking en français!